Albany pitcher Brittney Turner: "What we need to work on is making simple, routine plays and not letting the mistakes get to us." Turner and Giamalva combined on a one-hitter with 14 strikeouts in an 11-0 win over Baker on Monday. Albany used a six-run third to build an 8-0 lead and tacked on single runs in the sixth and seventh innings. Brianna Smith had a two-run single and Giamalva a two-run double to spark the big inning. Turner and Giamalva combined to strike out 10 while giving up two walks. Annie Romano and Kaylie Dorsey combined to give up 16 hits, 10 runs and three walks while striking out three. Turner was 3-for-4 with a run, while Heather Degenhardt, Rayanne Ridgel, Smith and Maddie Oubre each had two hits for Albany. The Lady Hornets put together a six-run second inning to build a 7-0 lead. Madison Knight was 3-for-3 with three RBIs and two runs, while Abbie Spring went 2-for-3 with two runs and RBI to lead Albany. Turner struck out six without giving up a hit in two innings, while Giamalva gave up one hit and struck out eight in three innings. Albany Hornets Varsity's two pitchers didn't allow a single hit, as Albany Hornets Varsity defeated Springfield 10-0 on Tuesday. Brittney Turner induced a fly out from O Morris to get the last out of the game. Albany Hornets Varsity secured the victory thanks to six runs in the third inning. The offensive onslaught by Albany Hornets Varsity was led by Rayanne Ridgel, Brianna Smith, Ellie Torrance, and Annalea Giamalva, all driving in runs in the frame. Albany Hornets Varsity fired up the offense in the first inning, when an error scored one run for Albany Hornets Varsity. Albany Hornets Varsity notched six runs in the third inning. The offensive firepower by Albany Hornets Varsity was led by Ridgel, Smith, Torrance, and Giamalva, who each had RBIs in the inning. Turner took the win for Albany Hornets Varsity. She allowed zero hits and zero runs over four innings, striking out six and walking one. A Romano took the loss for Springfield. She lasted three innings, allowing nine hits and eight runs while striking out three. Albany Hornets Varsity tallied 16 hits. Turner, Heather Degenhardt, Maddie Oubre, Smith, and Ridgel all collected multiple hits for Albany Hornets Varsity. Turner went 3-for-4 at the plate to lead Albany Hornets Varsity in hits. Albany Hornets Varsity was sure-handed and didn't commit a single error. Madison Knight made the most plays with six. Albany Hornets Varsity stole four bases during the game as two players stole more than one. Degenhardt led the way with two. Albany Hornets Varsity defeated Baker 11-0 on Monday as two pitchers combined to throw a shutout. 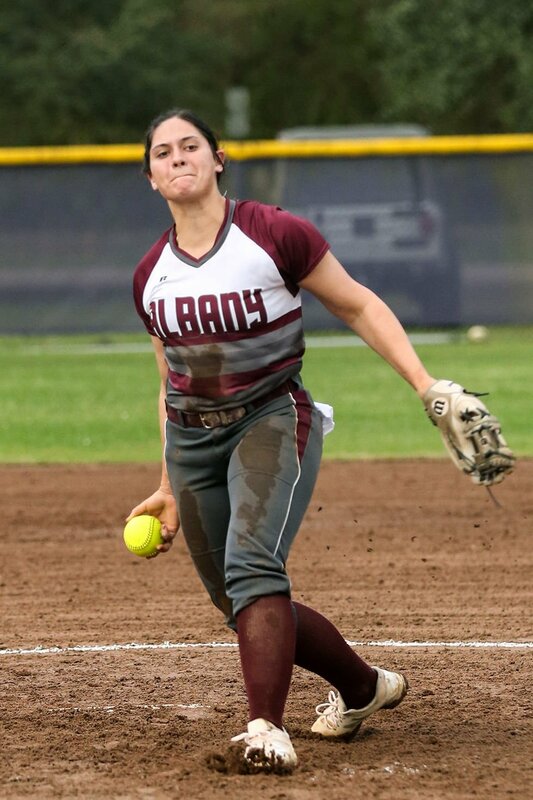 Annalea Giamalva struck out Morris to finish off the game. Albany Hornets Varsity secured the victory thanks to six runs in the second inning. The offensive onslaught by Albany Hornets Varsity was led by Ellie Torrance, Giamalva, Heather Degenhardt, Brittney Turner, and Rayanne Ridgel, all knocking in runs in the inning. Albany Hornets Varsity got things started in the first inning when Madison Knight tripled on a 3-1 count, scoring one run. Albany Hornets Varsity notched six runs in the second inning. Torrance, Giamalva, Degenhardt, Turner, and Ridgel each had RBIs in the big inning. A single by Morris in the third inning was a positive for Baker. Giamalva pitched Albany Hornets Varsity to victory. She surrendered zero runs on one hit over three innings, striking out eight and walking zero. Rivers took the loss for Baker. She allowed nine hits and 11 runs over five innings, striking out one. Albany Hornets Varsity socked one home run on the day. Turner had a long ball in the second inning. Albany Hornets Varsity collected nine hits on the day. Knight and Abbie Spring each collected multiple hits for Albany Hornets Varsity. Knight went 3-for-3 at the plate to lead Albany Hornets Varsity in hits. Morris led Baker with one hit in two at bats.